Nine new scrapbooks from High Point have been digitized and are now available at DigitalNC, courtesy of our partner, the Heritage Research Center at High Point Public Library. These scrapbooks are from throughout the 20th century, with a few dating from 1920-1940, while others date from 1963-1974. They join previously digitized collections, dating back to 1952. These scrapbooks contain newspaper clippings from the High Point Enterprise and the Greensboro Daily News, arranged in chronological order. In many cases, articles were pasted and taped into the scrapbooks overlapping each other, so digitizing these required taking multiple images of each page. Some of the scrapbooks also contained handwritten indexes in the front for easy navigation. 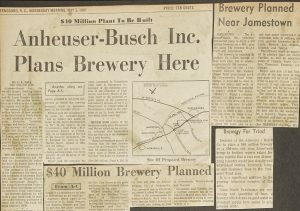 Many of the newspaper clippings related to local events in High Point and Greensboro. For example, one page contained articles about the selection of police officers in High Point, city employees attending a safety meeting, changes made to the High Point City Hall offices, and more. Other events covered included political events and local races, and decisions about town planning. Every so often, national and international events are also included. To learn more from the Heritage Research Center at High Point Public Library, please visit their partner page, or check out their website.